Lumia Denim is Microsoft’s unique latest firmware update to it’s range of Lumia Phones. The update is expected to bring changes like Passive voice “Hey Cortana”, Optimized Glance, Live folders, SMS merging, the best personal assistant on mobile Cortana as well as some imaging enhancements. Users with devices such as the Lumia 520, 530, 535, 620, 625, 630, 720, 820, 920, 925, 1020 and the 1320 will not be seeing some of the changes as this has to do with these not running on latest / higher hardware. Other new features include a smoother and faster browsing experience, VPN support and Apps Corner, the newest and easiest way to keep your personal life and business life organized on your Lumia smartphone. Optimized Glance Screen. For owners of Lumia smartphones with glance screen, you’ll now be able to see more of what’s important to you, even when your phone is locked. In addition to the current time, missed calls and app notifications, your glance screen is now able to show you the local weather from MSN Weather as well as MSN Health & Fitness data. Live Folders. Organizing your Lumia’s Start screen is now better than ever with Live Folders. Keep your games and apps grouped in a more personal way simply by holding and dragging an app over another app to create a new folder on your fully-customizable Start screen. Rename folders and rearrange tiles within a folder for an even more personalized Start screen experience. A faster and more intuitive Lumia Camera app. The app will deliver images of the highest quality at the fastest speed, allowing you to capture multiple photos with just milliseconds between shots. Moment Capture. This feature provides the quickest and easiest way to capture memories in high definition. A long press of the camera button automatically starts 4K-quality video recording at 24 frames per second. With each frame at 8.3 megapixels, you can save individual frames as high-quality still images. Due to hardware differences, Lumia 830 shoots Moment Capture in Full HD, not 4K, and with reduced 2-megapixel per frame quality. Rich Capture. This simplifies picture taking with auto HDR, Dynamic Flash and Dynamic Exposure. Avoid the hassle of adjusting camera settings and focus on capturing the moment: Shoot first, edit and select the perfect shot later. So far the updates have been rolled out to the following devices with the rest still undergoing testing. As a note, this detail is for the GH country variants devices, if you purchased your device from out of the country or any other store that didn’t get their device supplied by Microsoft mobile Ghana then yours will definitely be of another’s and you’ll need to wait on their device update schedule. Your phone should automatically notify you when an update is available, but you can also check this manually by tapping Settings > Phone Update. 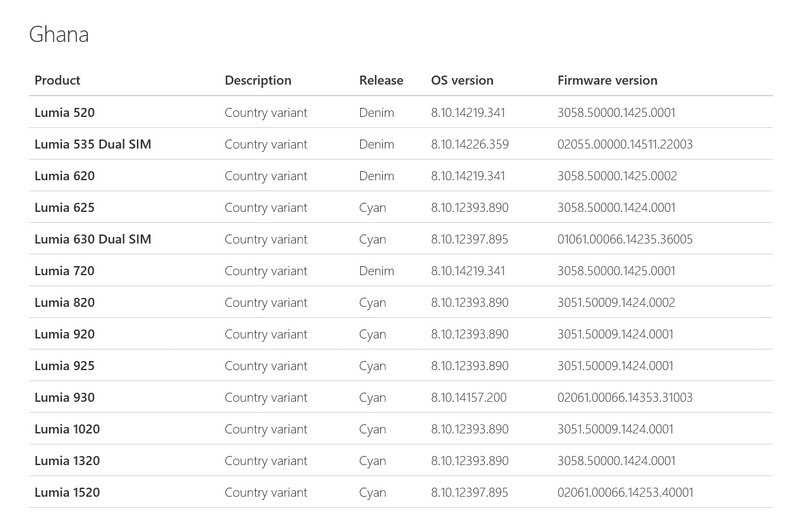 Have you installed Lumia Denim already?